I’d been looking forward to visiting Granite Haven for months. It’s the perfect name for a farm in the Strathbogie ranges. The land here is hilly, with short grass dotted with granite rocks. It reminds me a little of Scotland, but there are more eucalypts here! Cheryl had opened Granite haven to the public for a day and she’d been hosting visitors all morning. We were lucky to arrive at a quiet time so we had Cheryl and her husband Warren’s attention all to ourselves! We visited the sheep in the lowest paddock. They were all interested to meet us because Cheryl had a snack for them. I was surprised to see the sheep coming up to Cheryl for cuddles; she knew where they liked to be scratched! Gotland sheep. The Vikings used these sheep for meat and skins on their voyages. Gotlands are traditionally grey. Cheryl’s bred them to bring out black, charcoal, white and blended silver grey to charcoal colours. 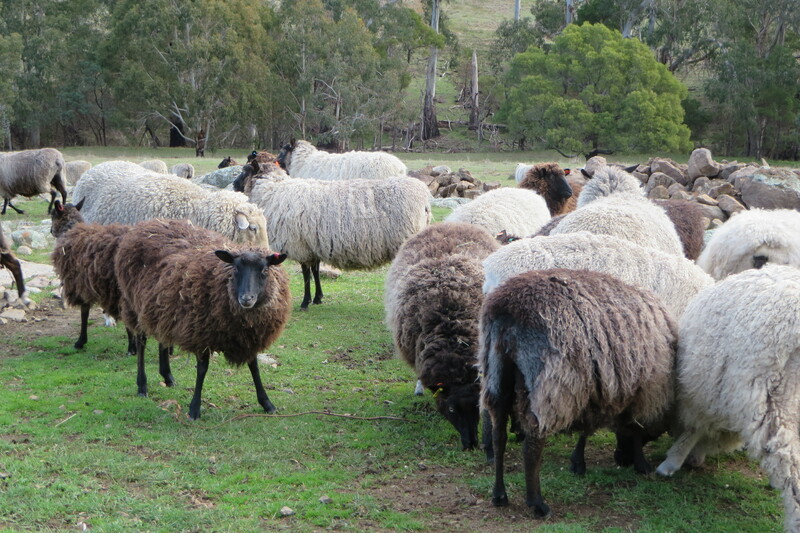 Their wool has a long staple, high lustre and soft handle. 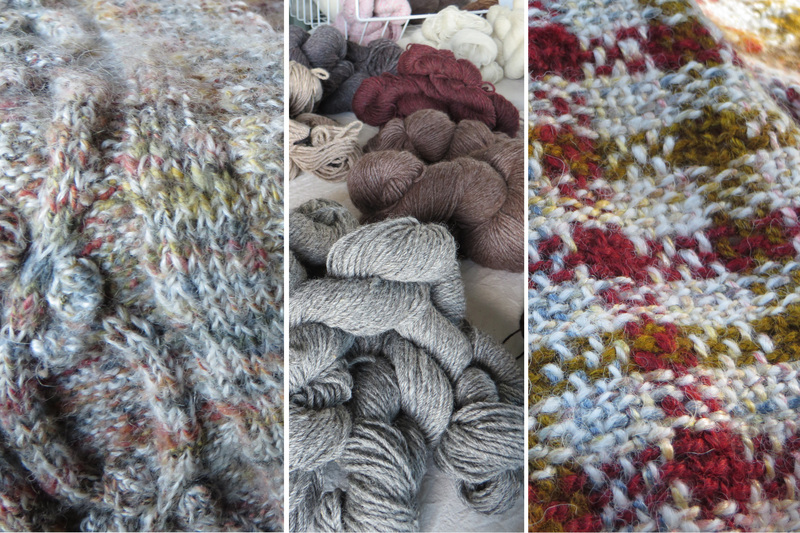 The grey wool overdyes in beautiful soft tones. Cheryl’s wool is either processed on the farm or at a mini mill. In both cases, she makes sure that phospherous-free detergents are used. She’s well versed and proud of the low environmental impact of her fibres. 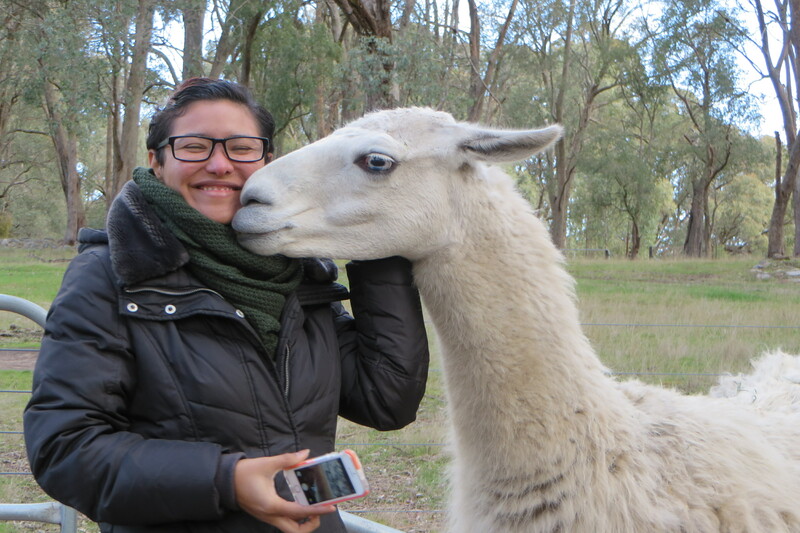 We also got to visit Cheryl’s llamas. They’re alarmingly large compared to alpacas, but they were just as curious about us as we were of them. I love that Cheryl bought them because she likes to trek in the surrounding hills! Llamas love a dirt bath, so their fibre is more trouble to process. Cheryl does sell llama tops but doesn’t process yarn any more. 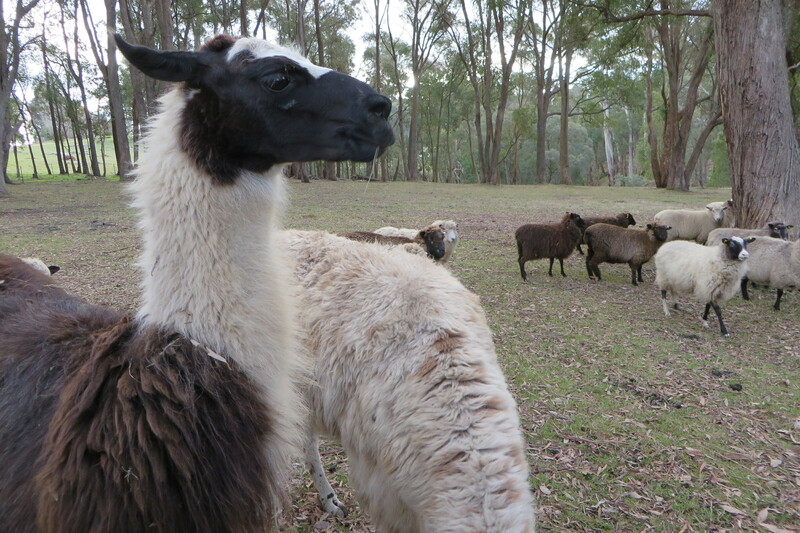 She’s been told by spinners that llama has a reputation for being better than alpaca, but we’re not exactly sure why. All the farmers I’ve met so far have been wonderfully open and helpful, but Cheryl takes the cake. She’s given me a list of people to contact and had lots of good tips for the Fibershed project. Best of all, Cheryl told me about an experimental yarn blend she’s working on that could be an eco-alternative to conventional sock yarn (which contains non-biodegradable nylon). I’m going to use this idea when making my first #1year1outfit garment! Cheryl had a small farm shop open on the day full of rovings, plain and blended yarns in skeins. She also sells knitting kits with beautiful patterns by independent designers. I was amazed how tight Cheryl’s margin on yarn is – it was a wake up call for me on how challenging developing a boutique product can be. We left Cheryl and Warren as the sun was setting over the granite hills. We’d stayed much longer than we intended, warmed by stories, cups of tea and cake. The trip had been worth the wait!